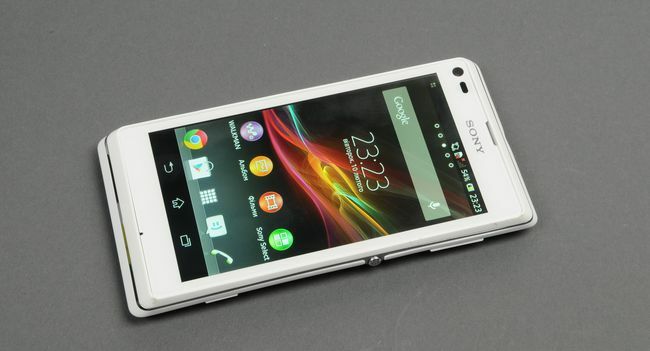 After a couple of months after the flagship Xperia Z and Xperia ZL company introduced new models of mid-priced segment. On one of them – Sony Xperia L, we met today. The company’s website says that the Xperia L – «mobile phone-based operating system Android, developed by leading experts in the creation of cameras Sony», let’s see what came of it. The smartphone comes in a small cardboard box of white, where in addition to a smartphone, you can find a charger with capacity of 1.5 Ah, USB-microUSB cable, and documentation. Headset is not supplied. On the review sample came in white, yet there are versions of red and black. Taking smart phone in hand, one wonders unusual form back cover – it’s a bit concave inside, it might even seem that because of this smartphone will be uncomfortable to hold in your hands, but in practice this is not an issue. The device has a 4.3-inch screen, so the case has been quite compact, despite the wide border around the display. Keep him comfortable, concave back cover adds comfort for the smartphone in landscape orientation while playing games or watching videos. On the right side there are three physical buttons on the device: a volume rocker, a power button and the capture key. The volume keys and camera have a short stroke with a distinctive click when pressed. The power button is located almost in the center of the sidewall, it protrudes slightly above the body and is always easy to touch. You can only criticize the volume button – it is already on the bevel rear cover, and because of the short length of use to it is not very convenient. The headphone jack is located on top, and the microUSB connector for charging and syncing – to the left. On the bottom is a luminous strip that informs about the state of charge of the device, missed events, as well as the lights in the gallery. The body is made of plastic milk-white in color. The back cover is a bit of flex in the lower part, and the bending hear some creaking. It snaps into many small clips, but in the power button is loose to the body – perhaps this is just a feature of our sample, because judging by his appearance, he had not passed through the hands of one. However, if this time is important to you, it’s worth checking before you buy. Sony Xperia L has a display diagonal of 4.3 “with a resolution of 854×480 pixels, it is covered with protective glass, resistant to scratches, no oleophobic coating. Part of the screen occupied by the on-screen control buttons. Unfortunately, it is similar in color rendering with displays other smartphones Sony’s latest generation : The colors are faded and the black color looks rather dark gray. Interestingly, these features are evident mainly in third-party applications. When viewing videos and photos is not so noticeable – the effect of optimization Mobile Bravia Engine. Automatically adjusts the brightness of the brightness always puts a little more than necessary – obviously this is done to ensure that the colors do not seem so dull. But the viewing angles are worthy of praise – even in a strong rejection of the brightness almost falls, the colors are not inverted, and do not fade. In the sun, the display dims considerably, but remains readable. The value of the minimum brightness of 51.5 cd/m2 at 50% illumination – 186 cd/m2, the maximum value is 361 cd/m2. Measurements of color indicators confirm the subjective impressions. The screen supports four simultaneous depression. Smartphone running the operating system Android 4.1.2, is used as an interface shell Xperia UX, which significantly changes the appearance of Android. The reviews Sony Xperia Z and ZL already described the main advantages and disadvantages of the shell, so that will not be repeated here, we describe a few additional points. Folders are created by dragging and dropping labels on each other in the application menu also has the ability to create folders. If you have created a folder added to her several application shortcuts, and then delete all but one, the folder will remain in place until you release the last of her label. The switches in the notification menu to enable or disable the transmission of data or other functions, long press on the switch does not translate into the appropriate setting item. The ability to customize the order of the items or switch settings are not provided. Small applications that are present in the flagship Xperia Z, no. Curtain notification is not available from the lock screen. Noteworthy is the integrated keyboard Sony. From here you can choose from several layouts (T9, qwerty, qwerty with the introduction of additional characters), and color options, including individual keys smiles, points, voice input. Xperia keyboard supports the input by means of gestures, like Swype. The functionality of the integrated keypad eliminates the need for alternative options. For speakers and when playing music in the headphones are available a variety of software settings. The external speaker is quite loud, his sound is visible in noisy environments. At the same time, the vibration is very weak – if the phone is in the pocket of clothing, his work you will not feel a thing. The earpiece is loud enough to talk in a peaceful setting, but the stock volume had almost none. The device has 8 GB of internal flash memory, of which about 1.6 GB is reserved for the application, and 4 GB – for the user’s data. Of this amount, 1.3 GB is available for the installation of their applications, and 3.5 GB – for data. Also there is a slot for a memory card that is inserted or replaced to remove the battery. The smartphone unit is installed Exmor RS backlit (8 megapixels). The device is able to record video in 720p, there is support for HDR-video. Instead of the promised marketers’ less than one second “launch the camera takes a second or two, which is quite normal for a mid-end smartphones. Pictures of the machine pretty quickly. Camera app has many settings (including even the behavior of the button start the camera), leaving room for experimentation. Under normal shooting conditions, the pictures are of sufficient quality both indoors and outdoors. The quality of images at night is normal, it is only slightly dependent on the selected shooting mode. The smartphone is built on a processor Qualcomm Snapdragon S4 Plus (MSM8230 + Adreno 305), two Krait cores running at 1GHz, RAM – 1 GB. In addition, a full range of wireless connectivity options – including NFC, Bluetooth 4.0, Wi-Fi 802.11 a / b / g / n support work in two ranges. Still there is FM-radio with RDS. In practice, this iron provides a fairly smooth operation of the interface, it works fast and stable. After the download is available for about 460 MB of RAM, which is enough for the background of multiple applications. The smartphone has no trouble with popular modern games. With the HD-video playback is also all right – a series of show at 720p in the container. Mkv reproduced without problems (using player DicePlayer). Wi-Fi is fast, the sensitivity of the module is sufficient. GPS satellites are found in about a minute. Everything is quite expected and well. Below you can see the results of the different benchmarks. Meals smartphone provides battery capacity 1700 mAh * h Although the performance capacity is not a record, in normal operation (synchronization between accounts Google, up to one hour of calls, a couple of SMS, Twitter, and tape reading news during the day, two hours of music, occasional video viewing) Smartphone easy living day light (without the use of modes energy savings). The smartphone is mode STAMINA, which disables the transmission of data and background job applications when the screen is turned off, leaving only the active phone functionality. Available as a constant work in this mode, and run at a specific battery level. You can also allow specific applications running in the background. In addition, you can configure a separate disable various modules when the battery is low. Depending on the usage profile, phone, these modes can significantly extend battery life. Sony Xperia L leaves a mixed impression – a smartphone has both its advantages and significant weaknesses. At the time of review of the cost of a smartphone in the shops of 2500-2700 hryvnia (proposals with official warranty). For the same money you can buy last year’s model as upper-middle price range, and many models of B-brands on the platform MediaTek, many of which will have a better screen and assembly. Therefore, the device can only recommend to people looking for a loyal brand and a good camera for reasonable money.